Octopus Cloud is here! Yes, after many months of planning, coding, testing, bugfixing and re-testing, we're launching Octopus Cloud to the world. Octopus Cloud is a fully-featured, real Octopus instance, hosted and managed by experts. 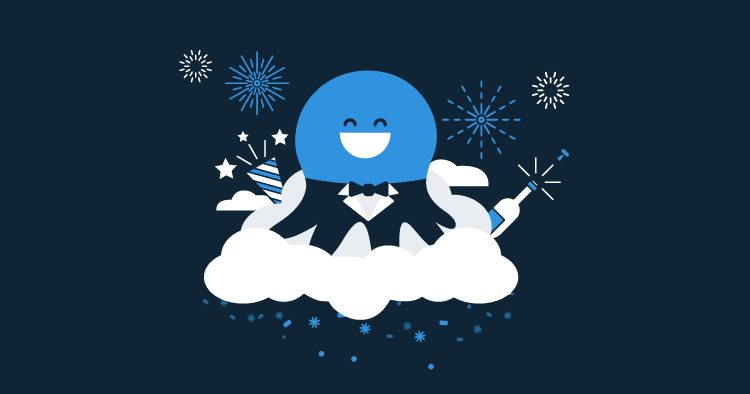 We've put in a lot of effort over the last year to make sure that the features you enjoy now in your self-hosted Octopus instance are also available in the cloud version. We haven't built an Octopus-Lite. We use the same code you can download from octopus.com, hosted in the cloud and managed by a team of battle-hardened DevOps veterans. It's hassle-free. We take care of keeping the infrastructure running so you don't have to. We do the backups, we monitor the performance, we roll out upgrades and we do all the associated heavy lifting. If something fails, we fix it. You don't have to manage that pet VM any longer. Just concentrate on delivering great software and we'll herd the octopi. It's affordable. Our commercial team has worked day and night to come up with a pricing model that works for everyone. Our Starter Edition for teams up to five users costs a flat $10/month. For larger teams, we move up to the $20/user per month Standard Edition, and we have Enterprise offerings coming in Q3/4 of 2018. It's safe. Your data is important to us - so we keep your data safely backed up and encrypted. You can request a copy of your data at any time should you wish to move back to a private instance. We've throttled back a couple of the more high-octane, full-trust capabilities of the server, but these tasks can still be executed just fine on a full-trust Tentacle target. It's fully supported. As with our self-hosted version, the Octopus support team is just a few keystrokes away. Support is included in the price, so don't be shy. You can sign up right now for a 30-day trial of Octopus Cloud.